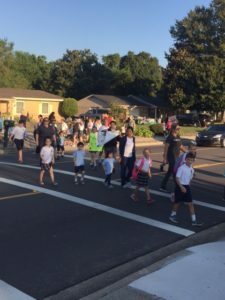 Organized by the Partnership for a Walkable America, Walk to School Day in the USA began in 1997 as a one-day event aimed at building awareness for the need for walkable communities. This event has become part of a movement for year-round safe routes to school and a celebration each October. On Wednesday, October 5th thousands of schools across America and in more than 40 countries worldwide participated in this event. Our Lady of Fatima Elementary participates annually in this event. Students, parents, faculty, and interested parties are invited to walk to school. OLF Elementary sets up different starting points and the participants walk to school. Ms. Cindy Hahn, Principal of OLF Elementary, says this is a great way to start off the school day by walking to school. The faculty uses this day to promote physical exercise, discuss how walking can reduce congestion and air pollution along with building a sense of community.